This was my first pair of socks, ever! I feel like I’ve come of age as a knitter. I wet-blocked both socks, squeezing as much water out as I could, and then laying them on a towel and making them sock-shaped. Blocking softened up the yarn nicely. The socks also grew a wee bit after blocking, which was great because they were a little tight before and now they fit better. I probably should have made the foot or toe a little longer, but they still fit pretty well. Knitting these socks was tremendously fun—lace! socks! what’s not to love?—and kind of trying, as I struggled with both the yarn and the pattern. As I mentioned in my previous post about the socks, the yarn is snarly. I would barely manage to knit through one round of yarn barf before the skeins would barf again. I don’t know if these particular skeins were horribly neglected or abused in the shop or what, but if there’s such a thing as feral yarn, this was it. I also had three points in the pattern where I got stuck. Lace Pattern. The lace pattern, as written, is asymmetric. If you’re a fan of symmetry like I am, change the first k2tog to a ssk. Heel. The pattern says to work all of one heel and pick up the gusset stitches before working on the other, but you don’t actually need to do that. You can work both heel flaps back and forth at the same time. However, you do need to do the entire heel turn and pick up the first set of gusset stitches on one, and then the other. 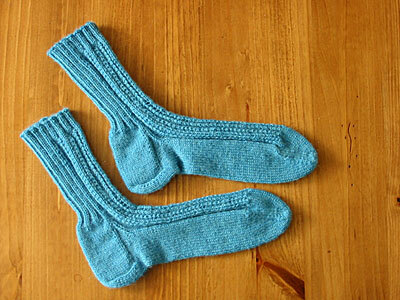 I also had a little confusion about heel flap length, but I chalk that up to being an inexperienced sock knitter. Toe. After going over and over it, I have to conclude that the pattern has an error in it. The pattern seems to have decreases on one side of the foot only, since the decreases are only at the beginning and the end of a round. Based on this, you’d need to knit 52 rows to finish the toe decreases and that just seems like too many, considering that gauge is 30 rows per 4″/10cm. It seems like other people also had toe issues with this pattern. I wound up doing four decreases every other round, one pair of decreases on each side of the foot, and then kitchenering when I had 16 stitches left—8 stitches on each needle. The resulting toe looks a lot more like the one in the pattern picture than when I was trying to follow the directions. Despite the problems, I’m now fully drawn into the Sock Knitting Dark Side. I’ve been eyeing my stash of sock yarn trying to decide what to cast on for next. The Embossed Leaves Socks? Hedera? Or BOTH? CogKnition posted this on July 13th, 2006 @ 12:56pm in Finished Objects, Socks & Slippers | Permalink to "Straight-Laced Socks"
Great job! Now you’ll probably become a sock addict. It happened to me. Great job, they don’t look to small. As for you next sock project, do them both!! Really nice work! Do both new patterns – you know you wanna! I love them. I was steered away from these because they were labeled as extra spicy. Was the pattern hard? Hi Gail, welcome to my blog. The pattern wasn’t hard. I think the extra spicy rating is mostly due to the two socks on two circs technique, but there’s no reason why you couldn’t do it on dpns or using magic loop. The pattern itself is fairly straightforward. I did have a few points where I found the pattern a bit confusing (listed above), but most of the time I had no trouble with the pattern. Ohhh gorgeous socks! Hmm, maybe I could do those next!!! Love the socks and know exactly the feeling of wanting to try another pair immediately. I haven’t even finished the first of my very first pair and already I’m eyeing up suitable (and highly unsuitable) yarns on the Net. I too was wondering if I could order in several more pairs of dpns and have LOTS going at the same time. No law against it, is there? Love your socks. You did a great job.